For racers not acclimated or accustomed to high altitude, hovering mostly above ten thousand feet, the Breckenridge 100, 68 and 32 mile races present a scenic challenge with three unique cloverleaf style loops nestled between three ski resorts that will bring you back to your friends and support staff after each loop to historic downtown Breckenridge. This phenomenal backcountry course comprises pristine high alpine singletrack, 11,000’passes, and multiple crossings of the Continental Divide. Many racers consider the B100/B68, one of the greatest challenges along the NUE Race Series circuit. Breck 100 and B68 Racers earned NUE Race Series points, attracting racers from all over the USA. 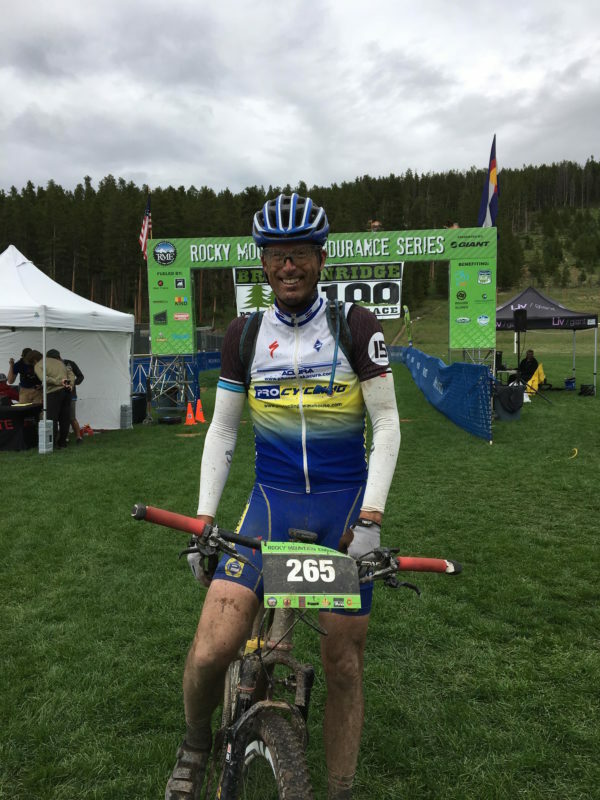 Racers also received points in the statewide Colorado RME, Rocky Mountain Series bringing together riders from all over Colorado. To receive a ranking and series rewards in the NUE Epic 100 and NUE Marathon Race Series, racers four best completed races count. Division winners receive the official unique NUE Champions Jersey courtesy of Voler, a share of a combined US$16,000 series cash purse, complimentary entry into all NUE National Series races in 2018, plus an all-expense paid trip in November to represent the NUE Race Series at the LaRuta de los Conquistadores, a three day stage race across Costa Rica, from the Pacific to the Caribbean considered one of the toughest mountain bike races in the world. Larissa Conners, Team Twenty20, crushed it at 10:10:19, the sixth fastest time on the day overall! 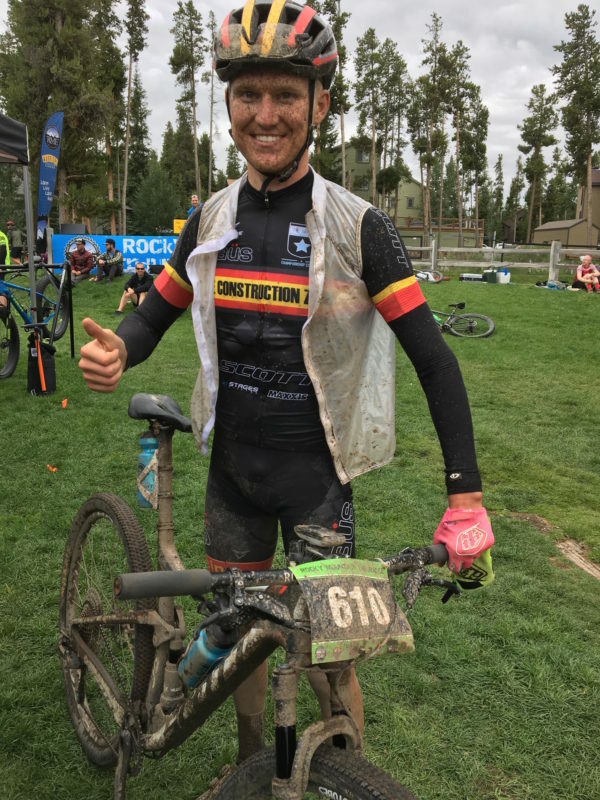 Chase Edwards, Flagstaff Bike Revolution, who finished fourth overall, last year in the NUE Race Series, was second at 11:37:50. 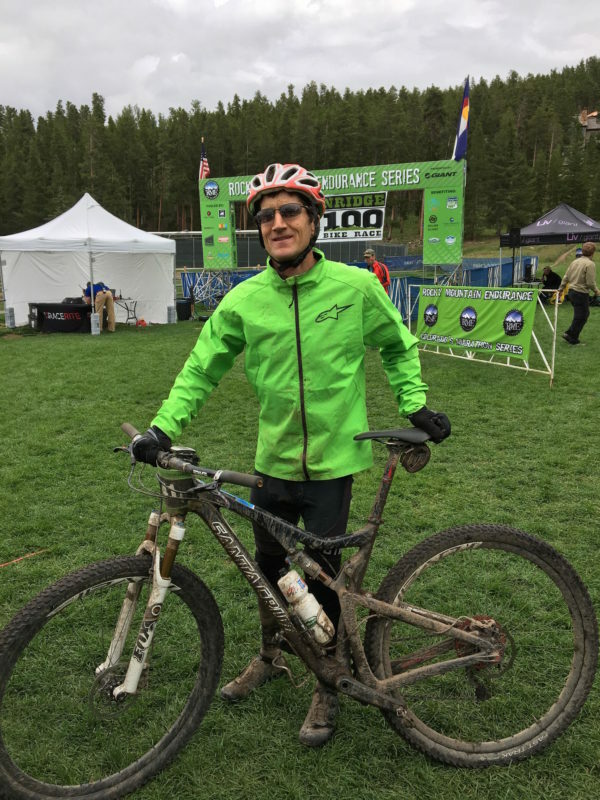 “This year’s Breckenridge 100 turned out to be the hardest 100-mile bike race I’ve ever done! I had two bummer moves early on that made it difficult for me to get my head back in the game. On the way up the first climb, my glasses fogged really badly. I saw Marlee Dixon take a right-hand turn and switch back above me. I was only a couple seconds back but I knew I should be riding her wheel closer because this is her backyard. I cranked up the watts to close the gap and focused really hard on the wet rocks in front of me through my fogged glasses. I wondered why the road wasn’t turning to the right the way it seemed like it should when I was watching Marlee, but I could barely see and just kept throwing down watts. I saw dots in the distance and told myself she must have made her move. It turns out those dots were hikers, and I eventually stopped and took off my fogged glasses. It was pretty obvious with my glasses off that I was not on course. I played around with my Garmin for a minute and then rode back down until I saw other racers turning onto the singletrack I had missed. I was pretty frustrated after this and, part way down Wheeler (the singletrack I had missed), I clipped a pedal on a rock, flew over the handle bars, and over the edge of the exposed trail into a bramble of willows. It was like landing on a mattress! If the willows hadn’t been there, I would have gone for quite the tumble down the exposed side of the trail. I crashed two more times on Wheeler after that and finally had to tell myself the singletrack was not my place to be making up time. Larissa Connors told me later that she rode with her eyes squinted and mud flying in her face the entire race without her glasses on because they were so fogged. Maybe I’ll try that next time! As I came into Carter Park at the end of the first lap, two women were standing in the trail wondering which direction to go. They must have been part of the marathon or the 35-mile. I wasn’t sure what to do, so I rode down to the staging area and started refueling. Then I saw other racers – including Parker Tyler (3rd place woman) – ride under the banner. I was so confused! I started asking around and someone explained to me the way the finish of the laps were supposed to work. It turned out the two confused women on the trail were blocking the way I was supposed to go so I rode back up, looped around on the singletrack the correct way, and back into the exchange area. I contemplated dropping at this point. My time was over a half-hour slower than I wanted it to be, I was freezing, and I had done a really bad job eating after taking my first wrong turn because I was so focused on making up time. But Parker was still in the exchange area, and I decided it was silly to drop this early on. Part way through the second lap, I saw Marlee working on a flat alongside the trail. This made me really sad. She’s an awesome gal and riding with her during several big races last year was a highlight of my season. 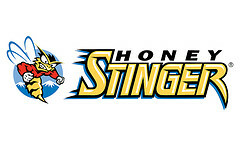 After that, I just went into survival mode and ate a lot of Honey Stinger waffles! Parker and I went back and forth the rest of the day. Five minutes later, Parker Tyler, Park City Bike Demos, finished third at 11:42:41. “We woke up to cold rain on race morning and I got excited that it was going to be a wet and muddy day. The trails held strong through the tough conditions and had some of the most amazing single track I have ever ridden. Knowing that there were epic descents after every climb was motivation to grind through some of the steepest climbs I have ever done in a 100 mile race. I started the race not feeling awesome as we climbed up Breck but I started to warm up quickly as we climbed up and over Wheeler Pass. Sweetser gets his first NUE Breck win! Sam Sweetser, Cole Sport, who finished at the NUE Series Opener at True Grit, earned his first NUE win this season to finish 9:04:43. Three minutes later, David Krimstock, Giant Co Factory, took second at 9:07:36. In March, Krimstock placed fourth at the NUE Series opener in Utah. “The weather outlook for the 2017 Breck 100 was marginal at best. It looked very likely we’d be getting rain at some point during the race but when the morning came, it appeared as though the worst case scenario was taking shape. As I rode down to the start in the rain, I was skeptical if the race could even take place. I felt good on the first climb up the ski area to Wheeler Pass but the wet, slippery conditions on the single track made me cautious, and I was passed by Tostado and Ross. I regained composure at the start of loop 2 and chased back into third by the top of the Little French climb. Then, while riding the flume trail, I got a flat which was probably caused by an old nail used in the mining operations 100 years ago. I really wanted to quit at that point, as I started to shiver while fixing the flat, and got passed down into sixth place. Still undecided, I rode down to my crew at the aid station. They had gotten word that I had flatted, and had my aluminum training wheel ready to swap out. After switching wheels, I pressed on, not sure if I could regain the ground I lost. After the Colorado Trail section, I found myself back in fourth and began to feel good again. At the start of loop 3, I was back in third position and knew that the home stretch was in sight. Once the Illinois Gulch climb was over, I saw Munoz on Boreas Pass, and went past him into second. I knew Sweetser is a great descender/trail rider, so it would be hard for me to catch him, but pressed on. After the gold dust trail, I got word that I was three minutes back, and tried to pick it up, but the day began to catch up to me and my legs weren’t having it. I could see him as we crested Boreas Pass for the last time. Descending the Bakers Tank trail, I just wanted to get down to Carter Park safely. The racer who has earned more Breck wins than any other, Josh Tostado, Santa Cruz, Shimano, Maxxis, came in at 9:30:17 to take the final spot on the podium. 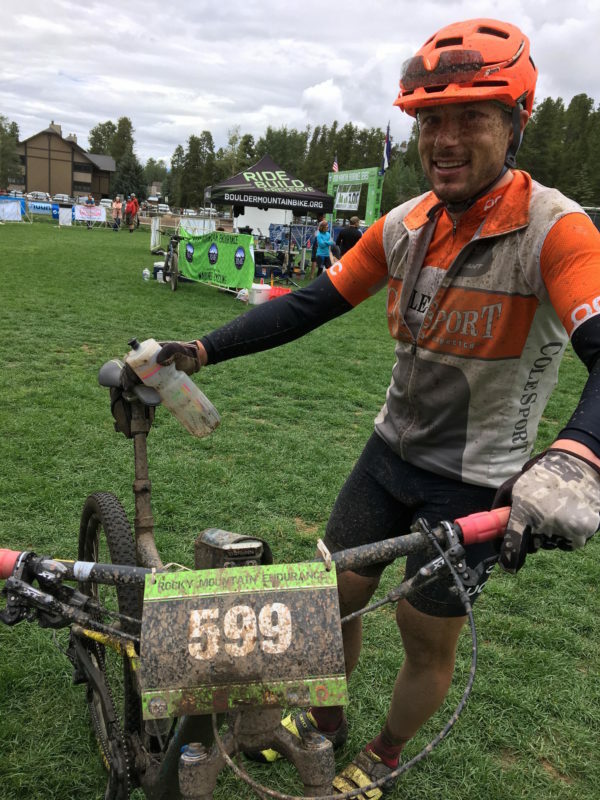 Having completed three of the required four NUE Races to qualify, Tostado currently stands 10th overall in the NUE Epic Point Series that includes a third place finish at True Grit and, more recently, a fourth place finish at the High Cascades 100 in Bend, OR. Seven minutes later David Ross, Go4Graham, was fourth at 9:37:17. An early leader in the race, Daniel Munoz, BAGHOUSE, held on for fifth place, one of just five racers to finish sub 10 on the day at 9:41:19. Kyle Trudeau, CZ Racing, had a commanding win and the only sub six hour finish at 5:43:57. “The Breck 68 was truly an epic day on the bike. 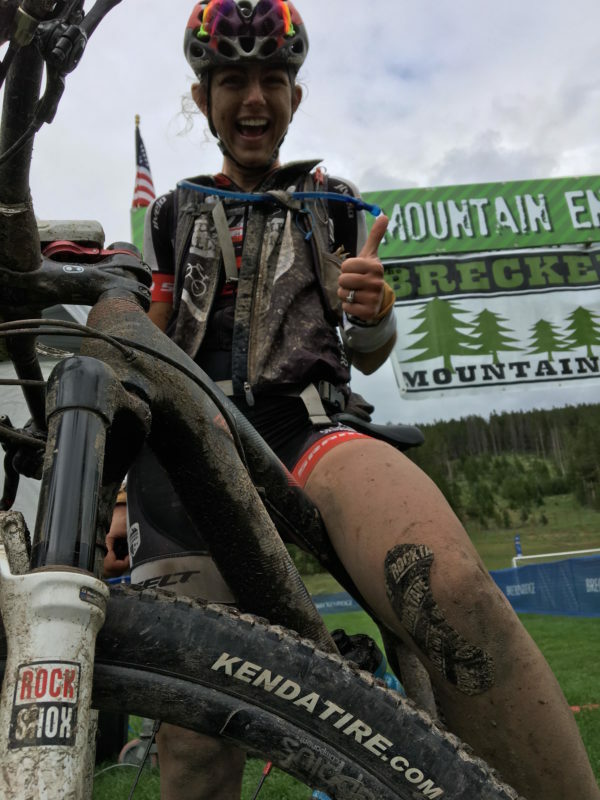 Typically, a race that lasts about four hours is on the long side for me so I knew going into the race with an estimated finishing time of about five and a half hours would be a new challenge and gaining experience for Breck Epic was an added plus. I’m a desert kid so when I was sitting on the starting line, in the rain, I would be lying if I said I was filled with joy. We set off on the roll out and, as the road pointed upward, there was a quick selection of about four of us (Alders, Dolzani, Rasmussen and me) about ten minutes into the race. The pace was set by Dolzani and soon it was just him and I on the first climb as it turned flowing stream/dirt road. Dolzani made a small mistake towards the top of the first climb that allowed me to get by him and then settle into my own pace. When the rain finally decided to stop the single track turned to Velcro and I tried to ride smooth and steady till the finish where I was completely boxed. My Scott Spark RC was bullet proof on the day, paired with some Maxxis Pace tires, and I couldn’t have grabbed the win without the support of Construction Zone Racing, GoTenac Coaching, BikeFlights.com, and Rouleur Carbon. Twenty nine minutes later, Bryan Alders, TrainingPeaks/Yeti/Pactimo, took second at 6:12:03. Fifteen minutes later, Weston Rasmussen, Honey Stinger / Bontrager, claimed third at 6:27:27. Timon Fish, Sticky Racing, crushed the Single Speed field at 10:14:24. Nesline would go on to experience both, the adversity and the joy that comes through persevering. “The day started out with pouring rain when I woke up at 3 AM. Knowing the importance of positive thinking, I looked at the rain in a good light. Being local, I know it’s not often in Colorado that you get to experience a rainy day. I was excited. The race started at 6am as I just rolled up to the line right as we started. I was feeling relaxed as we got into the climb up wheeler and tried to push to stay with the leaders but my legs were not having it. Knowing it’s a long race, I settled into my own pace up the climb. The rest of the first lap went by quickly. When I came into transition, I was told I was in second place. This was a surprise but I re-stocked my skratch and stinger and took off on my second lap. This lap is brutal. Lots of up and down, and the Colorado trail is relentless with its roots. In the past I have struggled on this lap but, as I started lap two, my legs had come around and I was feeling strong. All was going well, or so I thought, until mile 52. I had just come through the last aid station, ready to crank out the last nine miles. I hit the Singletrack climb and felt something weird in my pedal. I thought it was just a broken pedal so I kept riding, trying to ignore it. Then Snap! I looked down and see my crank arm had snapped off where the pedal connects. This is unfixable, but I had one option, keep going. I just kept riding, I don’t like or think quitting is an option. Keep riding somehow, someway, was the only thought in my head. After a few miles, I made it a challenge to myself to see how fast I could maintain uphill one foot Stridering/pedaling so, in slightly over an hour, I covered nine miles in various sketchy methods, finishing lap 2. As soon as I got into Carter Park, I went on a search to get a replacement crank to keep racing. I ended up running two blocks to Breck Bike Guides, got a new crank arm, and then headed out on third and final lap. It was thirty minutes from when I finished the second lap until I went back out on the third. This course is just so fun it’s really hard, in my mind, to even consider quitting for any reason. When I finished my second lap, I love the backside of Boreas pass. It so fun and that’s what made me want to go back out. As a coach of local high schoolers with Vail JR Cycling, I want my athletes to always finish their races – no matter what. I have to hold myself to that same standard. Through suffering and difficulty, we gain knowledge and the most useful things are learned about ourselves and life…. that shows we are capable of anything if we try hard enough. There’s nothing that we can’t accomplish. The third lap proved to be incredible! The trails were tacky and the downhills were the best I have ever ridden it. Incredible fun! Not knowing if I was still in second or not, I hammered as hard as possible and kept telling myself “you’re never out of the fight.” Anything could happen. I had my fastest time ever to complete lap 3 and my bike worked great all the way to the finish. To finish this race this year was not an easy accomplishment but, it was such a rewarding feeling to finish a race in this way and then the podium on top of that is just cool. I don’t race with a goal of podiums. I race with goal to race 100%, and give it everything I have. That way, no matter what happens, I can be satisfied with the result knowing there was nothing else I could do. I definitely did that today. If you are looking for a fun and difficult challenge, the Breck100 is it. I have finished this race five times, with two second place finishes, but it’s never gotten easier. Always fun. After the race, I stayed after and helped the venue clean up and load up the truck. This was a blast! It takes a village to put on these races and it’s important to help out when you can. Nice guys finish last? Just under an hour later, Bernie Romero, Mr. Nice Guy, would finish last at 13:03:56. However, Romero’s finish was good enough to take the final spot on the podium due to a higher number of racers unable to finish in the more difficult conditions. Greg Golet,Team Chico, earned a narrow win to finish 10:45:49, his third straight win in the NUE Race Series, following wins at both True Grit Epic in Utah and in the High Cascades 100 of Oregon. “When I read Ryan’s pre-race email, I dismissed his suggestion that this race would be just about surviving, but really that’s what it came down to–in a war of attrition. I was extremely thankful for the 5:30AM repair of my front brake by Eli (Carver bikes), but in my rush to get ready for the start I didn’t center the caliper, even though I knew I should have. Before we headed off on the 3 loop course the announcer said “be ready for rain all day, and if you hear thunder <5 sec after seeing lightning, do the right thing”. Such comforting words as we prepared to ride up to over 12k elevation. The first long climb was great despite the rain. Surprisingly, the altitude didn’t seem to bother me. At the top I stopped and put on a raincoat, which I noticed not all the other riders had. Even so, I got pretty drenched on the rest of the loop, though I know it held some heat in. At the end of it, I pulled my wool leg warmers on over my grit covered legs in hopes they’d help me warm up on loop 2. Heading out I was psyched up to be climbing for the warmth it brought, but even so felt my core temp dropping. As I fought my way up one particularly steep rocky section, a blue-lipped guy heading back the way we came said, “good luck man, I’m bailing”. Not long after, my rear tire lost some air, but I kept riding and eventually made it to the next aid station. 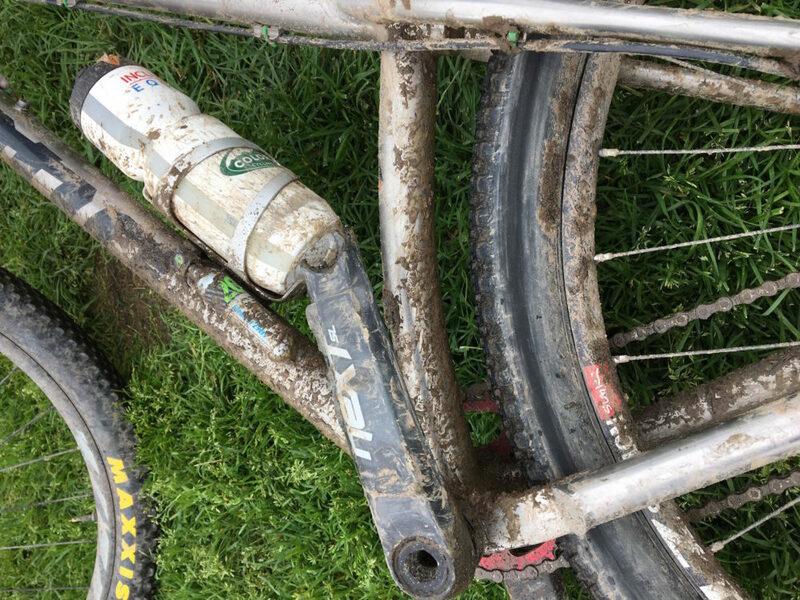 I was glad not to have to use my CO2, and actually really enjoyed how well my bike cornered and rolled over all the roots and rocks with low psi. Thankfully, the rain mostly stopped near the end of this second loop. Coming into Carter Park, I thought about stopping to see if I could replace my front brake pads, which had by this time worn away from the rubbing and grit, but decided it’d be best to just keep going. On loop 3, I rode pretty cautiously on the descents with no front brake and not wanting to flat. I also stopped at all the aid stations, and ate more and drank less than I ever have in a race this long. Despite the horrendous weather in the first 2/3rds of this race, it was one of my all-time favorites. Phenomenal terrain and scenery in the high Rockies and, as usual for a NUE event, top-notch racer support! Just five minutes behind Golet, Willem Jewett, Team Vermont, finished second at 10:50:06. ”For the past couple years, I’ve been combining Leadville 100 with a “family vacation”; bringing first one daughter and then both to Colorado for a week of riding before the race. Last year, we got a taste of Breckenridge trails with my college friend, Ellen Hollinshed. So we put together a “Team Vermont” to take on a new challenge. Our week of riding leading up to Breck 100 was unparalleled. We were able to pre-ride most of the course and had a ball doing it. Around mid-week, The Weather Underground started giving warnings that this good run of weather might end but the radar at 4 AM on Saturday didn’t look too bad. We had a brisk ride up the Mountain to the Wheeler trail. Turning onto the trail, I realized that race pace at 12,000 feet had created just a touch of dizziness; not the best thing on a narrow traverse. Dizzy and cold, I was a bit shocked by the speed with which a couple of riders passed me going down to Copper. I managed to descend with just a single (uneventful) fall and catch back up to those downhill streaks on the bike path. I got pretty grooved on the peaks trail. OK, I might have pushed things a bit too far and done some trail grooming with my face and knee but, you know, you have to find the limits, right? Out on the second loop, I did get a little worried as I heard tires rolling up on me at the bottom of the French Creek climb; whew, just some of the leaders in the shorter races. I may have made that French Creek climb a couple days earlier but it was just not happening. Still cold and a bit empty, I was eating through whatever I could dig out of my pockets as fast as possible. American Gulch was great fun AND the dirtiest downhill I’ve ridden in years. Things dried out a bit on the way up the Colorado Trail. I didn’t have much going up but you can’t let a climb like that go to waste, so I had a good rip at the downhill to the dredge boat. I wasn’t really loving the Gold Run stuff but was starting to feel like I might be able to get over Boreas a couple times and finish. I was even willing to believe the announcer at Carter when he said I was sitting in second. Loop 3 was all about avoiding a collapse. After that long (and somewhat boring) Boreas Pass climb, I did have a bunch of fun on the Baker’s Tank and Aspen Ally Downhills ’cause you gotta race to the tape! Look, Leadville is a great big fire road race but Breck 100 is a MOUNTAIN BIKE RACE of epic proportions. And, by the way, those youngsters I brought from the 802 – Ellie Curtis (18) was first in the 32 mile race and Abi Jewett (17) was second despite a flat tire out on American Gulch. Funny thing, I bought her a Co2 the night before and gave her a quick tutorial. After the race I think she said something like “I’m never using a pump again”. Thomas Barth took the third spot on the podium at 11:47:36. “I’m fifty years old, and started to renew my focus on racing XC a few years ago, but had not done long races or used to a structured training program for about twenty years. This year, I joined a training program through the Boulder Mountain Bike Alliance (BMA). I raced the Full Growler in May, got fifth in my age group, and continued training though the spring and summer, averaging about twelve hours per week using a coached program. I used a Pivot Mach 4, perfect bike for this race. On race day the weather was a concern, and I’ve never ridden a lot of the trails. The recent forest fire disrupted plans to pre-ride, but my strength has always been on tech and descending, so I concentrated on having fun and pushing myself. I kept my heart rate just below my threshold (or as hard as I was able to throughout the day) on the climbs and cautiously ripped the descents. NEXT NUE: The NUE Race Series heads to Grand Targhee Resort in Alta, Wyoming for the Pierre’s Hole 100 on August 6. Pierre’s Hole will host both the NUE Epic Series and the NUE Marathon Series offering both 100 mile and 100k options. Stay tuned right here for the latest news and reports. This entry was posted in News, Ultra Endurance and tagged 100 Miler, 2017, national ultra endurance series, NUE, results by Shannon Boffeli. Bookmark the permalink.